You’ve heard it a thousand times; a likely candidate for political office announces that he or she has chosen to not to run. Usually the candidate references family considerations as why he or she is not running. How do we in the public react? Often we first wipe that smirk off our face and then say something like, “Oh yea, I really believe that one.” We smell a rat and dismiss what the presumed candidate said. This has been a difficult, personal decision, and I am very grateful to my family for their total support of my going forward, had that been what I decided. It is true that many individuals testing the waters announce their withdrawals through code language when what they really mean is (a) I have little or no chance of winning, or (b) there’s no way that I can keep the dirt from coming out. If an individual wants to run for president, he or she will inevitably think of two terms and that will mean ten years of unimaginable intensity and scrutiny. Barack Obama announced his candidacy in February, 2007 and if he wins reelection will serve until January 20, 2017 – ten years. Any candidate who takes the plunge is saying that he or she will live on pins and needles for years to come. At the very least, this can be an extremely unpleasant way to live one’s life. At its worst, it can do serious psychological and moral damage to that individual. One of the questions raised about Richard Nixon when he was running for president was, “Would you buy a used car from this man?” I would have done so immediately if I knew that it would keep him on the used car lot and out of politics. From his earliest days in Congress in 1946 it was clear that this was not a man to be trusted. However, this was apparently not of concern to a great number of Americans. He served just four years in the House of Representatives and two in the Senate before moving on to two terms as Vice-President, and one and a half terms as president. Through his political career, he evolved from not just someone of questionable integrity to someone who clearly had serious psychological issues. This culminated when he was president of the United States and had his finger on the nuclear weapons button. What if in early 1946 Richard Nixon had said words to the effect of, “I have chosen to not run for Congress because with young children I cannot guarantee the electorate that I can fulfill the expectations that they would place on me.” Perhaps he really felt that way but did not back off from running because he thought such a decision would not be believed. Four decades before Nixon, Woodrow Wilson spoke of the “making the world safe for democracy” when he reluctantly lead the United States into World War I. On a less global level, democracy would be safer if we made it easier for those who would not serve us to walk away without being mocked. Why do they have to justify that they don’t want to spend years in a fishbowl in which any mistakes that they make would be greatly magnified over mistakes they would have made in private life. So who made the “I cannot offer that with certainty, and total certainty is required” statement above? It was not a progressive; not anyone close. 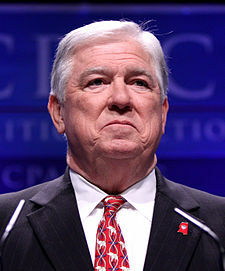 It was Mississippi Governor and former Republican National Committee Chairman Haley Barbour. Indeed there are good reasons to be skeptical of his statement. In recent months he has embarrassed himself and even the Republican Party by heaping praise on the pro-segregation Citizens Council. He diminished the seriousness of past discrimination against African-Americans. He has a shelf-full of other gaffes. However, he was right when he spoke of the demands of running for and serving in office, particularly the presidency. Those words are so true that it would serve us well to have serious questions about the motivation of anyone who wants to go through the travails of a campaign that never ends. When a candidate gives the usual platitudes form not running, we might harbor suspicions that there are other reasons, but we should not demean the inherent truth embedded in the platitudes. If we want better candidates, citizens need to minimize the pressure on candidates that makes running and serving potentially so unpleasant. We can demand shorter and less intense campaigns. We can be less judgmental of every decision a president makes. How many times have you heard someone say, “Who would possibly want that job?” This will remain a fair question until we address the real issues embedded in the platitudes. As is the case with so many of our political problems, the solution begins with us as citizens. Post Script: Convincing article about why Indiana Governor Mitch Daniels is not going to run for president in 2012 because of obviously real family issues.